In medium bowl, mix Bisquick mix and cornmeal. In measuring cup, mix eggs and milk. Stir milk mixture into Bisquick mixture to combine; fold in 2 tablespoons chives. Heat 10-inch or larger nonstick skillet or griddle over medium heat (325°F). Brush lightly with oil. Spoon rounds of about 3 tablespoons batter onto skillet to make mini pancakes. Once bubbles begin to form on surface of batter and edges begin to dry, turn and continue to cook until golden brown. Transfer to plate. Repeat with remaining batter. Set oven control to broil. Place cooked pancakes on parchment-lined cookie sheet. Spoon marinara sauce onto each pancake; sprinkle with cheese, pepperoni and the 1 tablespoon chives. Broil with tops 4 to 5 inches from heat 1 to 3 minutes or until cheese is melted, golden in spots, and bubbly. Serve immediately. 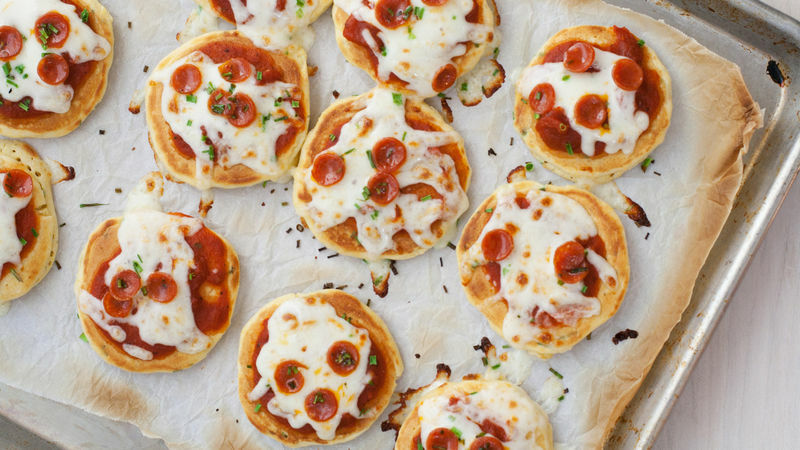 You can top these pizza pancakes with whatever your pizza-lovin’ heart desires! Just make sure to finely chop any vegetables and try to keep the toppings sparse, as too many moist toppings will make for soggy pancakes. You can make these pancakes a bit ahead of time, as broiling will heat these up nicely. If the pancakes are really cold, broiling them on medium or low for a bit longer will help reheat them through. Use a thick marinara or pizza sauce, and low-moisture mozzarella. A very wet sauce and fresh mozzarella would make a soggy pancake.